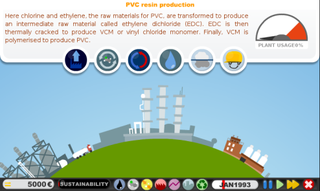 "This game represents in an informal and fun way today's European PVC Industry and the efforts the industry is making to ensure the sustainability of its production processes and applications." See? And let me tell you - the game is EVERY BIT as fun as that description would imply! "Clearly it is not easy to show the whole complexity of the vinyl system and the mechanisms that regulate research, production, markets and interaction with society (institutions, NGOs, consumers). We also like to apologise in advance , as in order to turn reality into a playable game we had to simplify highly comlex contexts and approaches and summarise them into a handful of situations."